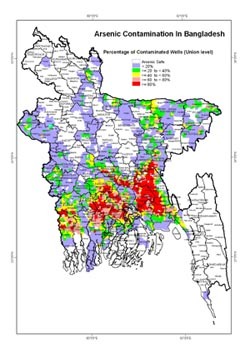 This web site provides access to a spatial interpretation of the distribution of arsenic in groundwater of Bangladesh calculated on the basis of nearly 5 million field-kit tests conducted under the auspices of the Bangladesh Arsenic Mitigation and Water Supply Program. The intention is to help identify at the village level a depth below which the available data indicate that aquifers are consistently low in arsenic. The rationale for this approach and the algorithm used to calculate such minimum drilling depths are described in this paper. The same paper explains how this information can be queried with a mobile phone using SMS from any village of Bangladesh with network coverage (specific instructions are available from another page on this web site). Two extensions of this approach that are currently being explored are (1) uploading of new, quality-controlled data from the field to update the drilling depth estimates and (2) a self-sustaining money-back guarantee program based on probability estimates that a recommended minimum drilling depth is correct.